Leonard Calvert, lead the sailing expedition of the Ark and Dove to Maryland in 1633. 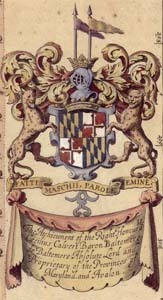 Leonard's older brother, Cecil Calvert, Second Lord Baltimore, had appointed Leonard to be Maryland's first Governor. Leonard carried with him a letter containing Cecil's "Instructions" These "Instructions" described how to establish Maryland's first elected Assembly and provided a set of laws for the colony. As Governor, Leonard was in charge of Maryland's militia, sea forces, court system and finances1. When the colonists landed in Virginia, Leonard hired Captain Henry Fleet to act as a guide. Leonard knew that Capt. Fleet would be a good guide, because Fleet had lived with Native Americans and spoke their languages2. In February 1634, the two ships approached the Chesapeake Bay for the first time. Leonard and Captain Fleet decided to go out and meet with the head chieftains of the Native Americans before the colonists landed. The Indians called their head chieftains by the title werowance. The Werowance of the Yoacomoco Indians agreed to sell a village to the Calverts in exchange for gifts, trading guarantees and protection from their enemies, the Susquehannock and Iroquois Indians. The Yoacomoco village property purchased by Leonard became the English settlement of St. Mary's City on March 27, 1634.3. Leonard's years as Governor of the new colony were often difficult. William Claiborne went to the King of England and claimed that the Calvert family had no right to land in Maryland. Claiborne and his fellow Kent Islanders had settled there and established a trading post with the Indians in 1631. King Charles I ruled in favor of the Calverts and this made Claiborne and other Virginians enemies of the Maryland colony. The Susquehannock Indians also raided and attacked English settlements as well as Piscataway Indian villages during the 1630s and early 1640s. Leonard did not stay in Maryland throughout the time he was Governor. Twice he left the colony to visit England in 1641/42 and 1643/44. He had a family in England, but because Catholic marriages were kept secret in England we do not know for certain who his wife was. Some historians believe that Leonard's wife was Ann Brent, sister of Margaret and Giles Brent4. We do know that Leonard had a son named William and a daughter named Anne who grew up in England. To make matters worse for Leonard, the English Civil War came to the shores of the Chesapeake Bay in the 1640s. Parliamentary supporter, Captain Richard Ingle and his men attacked and plundered St. Mary's City in 1645. Ingle captured some of Maryland's leaders. Some historians believe that Captain Ingle coordinated his attack with William Claiborne5. Certainly, Ingle wanted to claim the Maryland colony for England's Parliament. Leonard escaped capture and controlled Maryland's armies from a headquarters in Virginia. Leonard and his militia restored Proprietary control of the Maryland colony in 1647. However, Leonard died of an illness in the summer of the same year. Before he died, Leonard wrote a will naming Margaret Brent, the executor of his estate. As executor, Margaret had to follow Leonard's command to "Take all & pay all." This meant that he told Margaret to use money from both his estate and his brother, Lord Baltimore's estate to pay the militia men who had defended Maryland. Leonard's will also named Thomas Greene as the new Governor of Maryland. 1Timothy B. Riordan, The Plundering Time: Maryland in the English Civil War, 1642-1650. St. Mary's City, Maryland, forthcoming publication. St. Mary's City, Maryland, (June 1, 1997), page 2-7. 2Frederick J. Fausz, "Present at the 'Creation'," Maryland Historical Magazine vol. 79 (Spring 1984): 15. 3Fausz, "Present at the 'Creation'," 15. 4For example, see Edward C. Papenfuse, et al, Biographical Dictionary of the Maryland Legislature, 190. 5Timothy B. Rioridan discusses evidence for Richard Ingle and William Claiborne's collaboration on the attack, "The Plundering Time," 10-11 to 10-17. For a general description of the attacks on Maryland during the English Civil War, see Aubrey C. Land, Colonial Maryland  A History (Millwood, NY: KTO Press, 1981), 45-49. Click to see a picture of Leonard Calvert, by [Edwin] Tunis, Leonard Calvert, charcoal drawing, Tunis Collection, Maryland State Archives. MSA SC1480-1-1. Click to see a picture of Leonard Calvert Founding the Maryland colony's government, by [Edwin] Tunis, Founding the Government, charcoal drawing, Tunis Collection, Maryland State Archives. MSA SC1480-1-7. Leonard Calvert by Florence MacKubin (1914), oil on canvas, 30 x 25", said to be after a seventeenth century portrait in a private collection. MSA SC 1545-1106. Fausz, Frederick J. "Present at the 'Creation': The Chesapeake World That Greeted the Maryland Colonists." Maryland Historical Magazine vol. 79 (Spring 1984): 7-20. Riordan, Timothy B. The Plundering Time: Maryland in the English Civil War, 1642-1650. St. Mary's City, Maryland, forthcoming publication.